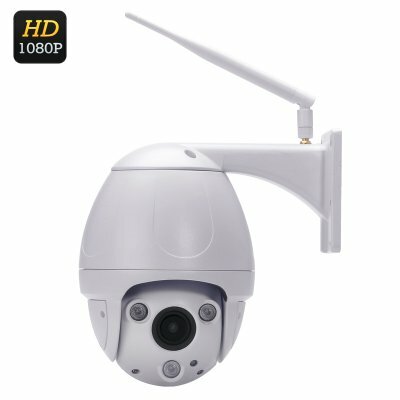 Successfully Added IP67 PTZ Dome Camaera - 1/2.8 Inch CMOS Sony Sensor, 4 Times Zoom, ONVIF 2.2, Motion Detection, Night Vision to your Shopping Cart. This dome security camera boasts a stunning 1/2.8 inch SONY CMOS sensor with 2 megapixels, this will bring full HD resolution video at up to 25 frames per second. The adjustable lens on this camera operates between 2.8 and 12mm allowing you to zoom in and obtain greater detail whenever needed. Added to that you can rotate the camera through 355 degrees on its horizontal axis and tilt it up to 90 degrees, now no intruder will be able to escape your gaze and with such crystal clear images you can easily identify those up to no good. This powerful IP camera supports up to 8 detection areas and if anyone enters into these zones the camera can alert you via a snapshot notification sent to your e-mail account, this menas that you can keep a vigilant eye over important locations or access points even if you not on the premises. With 3 IR Array LEDs the camera can keep guard night and day as it features a massive 50 meter night vision, just what you need for coving storage spaces, shop floors, warehouses, parking garages and more. Having an IP67 waterproof rating, this security camera can work in all weather conditions making it ideal for use outside. When it comes to protecting your premises this PTZ dome camera brings leading edge technology and top of the range features and is the perfect setup to start your security system with or expand an existing system as its ONVIF 2.2 compliant and works on the vast majority of systems and networks. This PTZ dome camera comes with a 12 months warranty. Brought to you by the leader in electronic devices as well as wholesale gadgets, Chinavasion..